How and where do these undersea earthquakes occur? What other things could create a tsunami? On 26th December 2004 a devastating tsunami hit Indonesia and affected several countries. The tsunami was caused by an underwater earthquake which measured 9.15 on the Richter scale. Amongst the affected countries was Somalia in Africa which is almost 3000 miles from the epicenter of the earthquake. 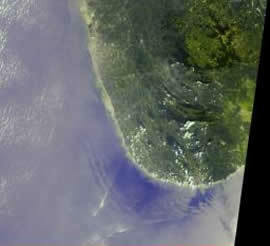 The initial tsunami waves took a little over 2 hours to reach the teardrop-shaped island of Sri Lanka. Additional waves continued to arrive for many hours afterward.